​University of Life Sciences in Lublin is a multi-profile higher education institution, which integrates a wide range of agricultural, biological, veterinary, technical and socioeconomic sciences. With a strong emphasis on practical application, well-equipped laboratories and modern teaching methods we guarantee the highest level of education. Since the beginning of our University students have been required to undergo compulsory practical training and internships in Poland and abroad. 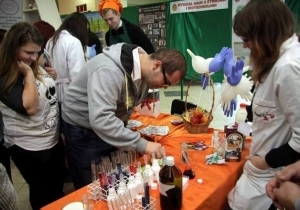 University of Life Sciences in Lublin is a multi-profile higher education institution, which integrates a wide range of agricultural, biological, veterinary, technical and socioeconomic sciences. With a strong emphasis on practical application, well-equipped laboratories and modern teaching methods we guarantee the highest level of education. Since the beginning of our University students have been required to undergo compulsory practical training and internships in Poland and abroad. We support our students' ambitions by encouraging them to pursue their interests and foster personal strengths. The Central Library's collection includes approximately 380 000 books, scientific periodicals and special items. Through PCs connected to the university servers the Library, being a participant in numerous consortia of scientific libraries, gives access to complete texts within dozens of thousands of periodicals. Dormitories provide places in fully furnished bedrooms with shared bathrooms and common TV room, study room, gym, canteen. Sailing marina is run by the University Club "Antares". There are cabin and Omega yachts, row-sailing boat, motorboats, kayaks. The station is a licensed sailing school of the Polish Yachting Association.